Me Update: I have been neglecting this blog a lot lately. I haven’t had much to say that I think I want to post to the big wide world of the intarnetz because a lot of what I’m doing these days that I can post about is mundane and kind of, well, meh. Not to say that my life is meh – but the details that are kind of interesting are semi-confidential in nature (what I’m doing for work, what some of my friends are up to that is exciting me, projects that are half complete I’m not ready to go public on, and so on). Suffice it to say, I’m making it my mission to post three times a week for the next little while to get back on track. I miss blogging. So, I’m warning you… there might be some boring posts in the future. Posts about recipes and my aspirations for what colours I want to paint my house, and neat links I have found and like. Oh, other “me update”? Yeah, so like every year in the past four, I have a lovely gaping lip wound. 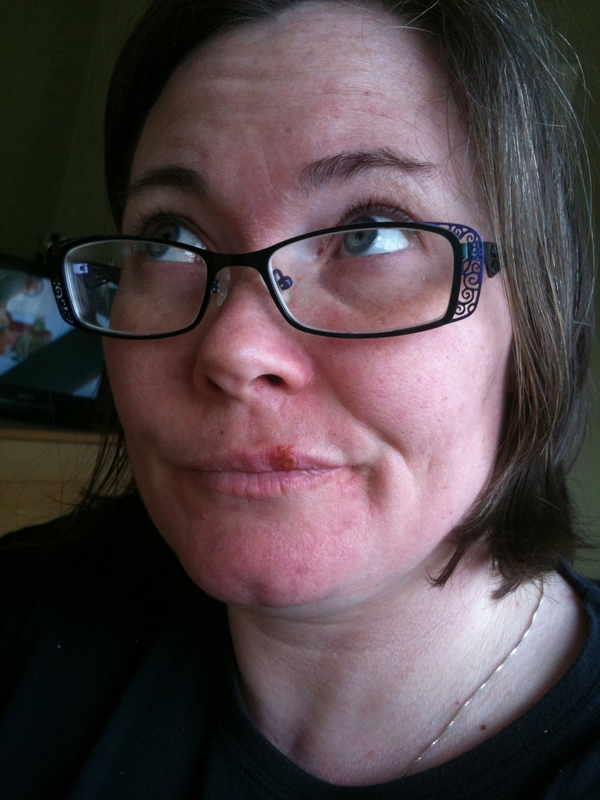 What happens is my lip gets chapped, then it cracks, and my overzealous application of lip balm bites me squarely in the bum and my lip heals, at least in part, with wax in the wound, and then the whole thing gets infected and scabs over! YAY ME! So, lip balm (or other lip moisturizing things) recommendations requested. House Update: We are almost complete on building the chicken coop (I’m photo-documenting that process and will blog about it separately), and I’ve decided on Plymouth Barred Rock chickens. Chickens with tweed jackets, if you will. Tell me they aren’t 100% awesome? We’ve decided on two hens, but if there was three hens we would take them as a group. No chicken left behind, I suppose. The coop we are building has an entertaining name – the Poulet Chalet – and Ross being Ross it’s being built with high quality lumber. Chickens, ahoy! Soon, my little chickens, soon we will meet. We’re also getting a rock wall built in both our front yard and around the corner of our back yard, where everyone cuts the corner and has been killing our hedges by, you know, DRIVING OVER THEM all winter long. Some neighbours up the alley have been renovating their house for some time and trucks of various sizes has been showing up. I give the drivers a reasonable amount of leeway – I know it’s a tight corner to be taking in a giant truck, but I’m also getting tired of seeing hedges that rightly grow vertically lying there in a horizontal fashion. 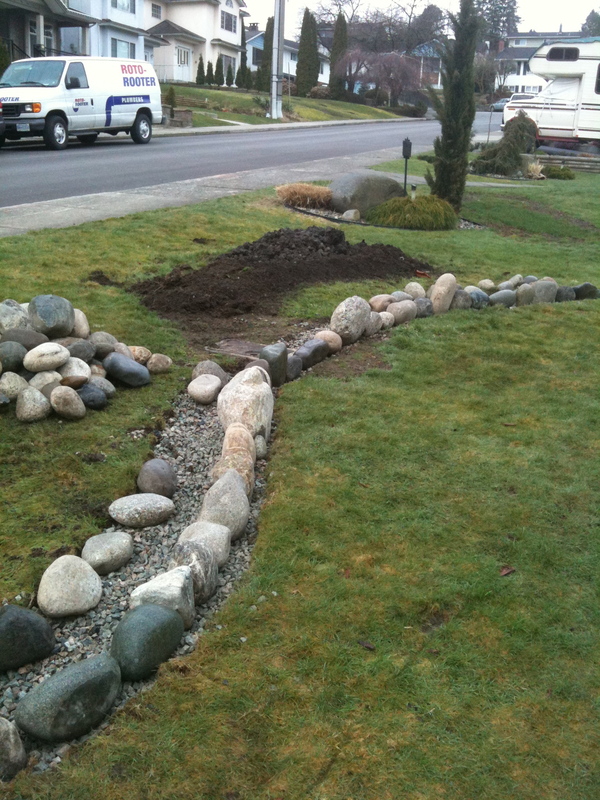 So, we decided to build a rock retaining wall around the corner. If they see that someone cares, they’ll take more care. Or at least, that’s my theory. Additionally, the renos are drawing to a close and it’s unlikely we’ll see many more giant trucks with roof joists and doors and what not, and so the only trucks likely to take that corner are City owned garbage and recycling trucks. And I’m prepared to file photos with the city to let them know I’M WATCHING THEM and that they better be prepared to pay up if my wall on my property gets broken. So, we hired a dude and this is what he's done so far. That space in between the wall and the sidewalk will be filled in and, much to my delight, we will be moving the goddamned rhodos from either side of the front door, and plopping them into that space, far far away from me. I hate rhododendrons. My hatred for them is slightly too passionate, to be honest. But they’re all show and pretty for two weeks and then turn into the most boring green bubble and they always look dead. I know they’re hardy and cheap and come in nice colours but I say BAH. Cosmic waste of my precious carbon monoxide, really. Kale’s birthday is coming up in a few months and I’m currently on the hunt for any wooden Thomas the Train tracks, trains, etc (got any you want to impart my way?). Kale’s been showing me he loves the little wooden trains, so I’m working on amassing a good collection of used stuff between now and his birthday. Hopefully, I can acquire a used train table as well that can live in our basement. In my mind, I will purchase one brand new plain Thomas but every other part of the train gift is going to be used. I don’t think Kale needs a lot of new “stuff”. The other part of his gift is a collaborative effort between my mom and I. Mom, who can crochet like no one’s business, is going to crochet a plain teddy bear. And I’m going to sew a bunch of teddy clothes. Kale’s been really thrilled lately with putting his clothes on his bears, but the bear to clothing roominess ratio is all wrong and the clothes routinely fall down which frustrates the heck out of Kale. So, a collaborative made gift it is. Speaking of birthdays, I turn 37 tomorrow (go me! ), Ross turns 37 on Tuesday, and we’re headed to the Island for the weekend. A bit of sunny weather sure would be nice. Also: bonus to heading to the Island? Buckerfields. Do you know what that means? Chicken supplies! Yeehaw! I’m so excited to hear you made soap! That’s exciting. I haven’t yet gotten up the gumption to do it – it seems like a lot of supplies. What are you using as your ingredients? It wasn’t as complicated as I initially thought. The Braun handblender saved a lot of time. I’ll probably blog about it when I can finally test out the soap (it has to cure for a month). So no SOS just Buckerfields. Man has your life changed in 37 years. From feeding chickens at Grandpa’s to owning chickens yourself. lol. He would be proud. Mind you Jamie has you beat in the number department. Life is good can’t wait for the extra eggs. ha ha. I know, seriously, who knew? Ok, I don’t even like chickens, but my gosh is that one beautiful! People drive over your hedges? That is lame. But that chicken is beautiful! I love that chicken! Happy Birthday lovely lady! Looks like your intended hens are all dressed for a party! Wish I could convince Ben of the awesomeness of our own chickens but I’ll be happy if we get a good go of our garden this year! We get our thomas tracks at VV! Do those chickens lay tweedy eggs?